I don't see a use for it. I don't usually write reviews for tools--I'm more a literature guy. Still, when I saw the negative reviews for this gadget tool, I felt I had to put in my two cents. First, the tool does what it's designed to do. It's a great adjustable wrench that helps grip nuts and bolts with great force. It's easy to use, very much intuitive. You place it over the nut or bolt head, squeeze, and turn. With very little practice, you develop a quick rhythm of releasing the grip, returning the wrench to a start position, and gripping again for a other tightening or loosening turn, much like a ratchet. It's all really quite simple. Of course, if you're doing work where you require a ratchet with an angle head or an extension to increase your reach to get you into tight spaces, e.g. engine work or some other application where you would NEVER use pliers, then don't go reaching for the Bionic Wrench expecting miracles! It works like a plier works, as advertised, so it's foolish to expect anything else from this tool. Sticking it deep into an engine where your hand barely reaches and expecting it to accomplish the impossible just because it's called "bionic" is just plain silly. Straight forward, they work. If you have easy access to the nut or bolt that you are trying to tighten/loosen they work really well and are comfortable to use. But if you are working on anything that is a bit tricky to get access to (such as anything to do with exhaust systems or anything under the hood of a car) these fall way short. 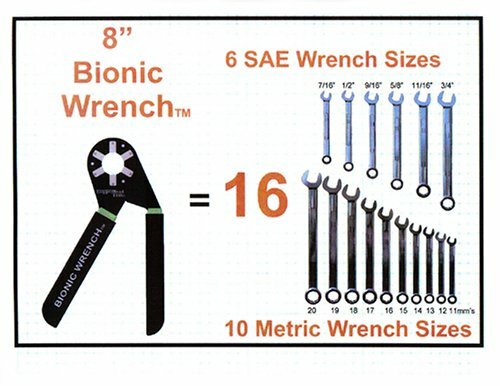 You need a lot more horizontal (or vertical) movement with these then your standard wrenches. And there are just some things that you can't get a box end wrench on (this is how this tool works, very similar to a box end wrench).